Every day doesn’t begin with gazing out a window, but by the time I’ve finished my oatmeal and first cup of tea, I’m often looking for words for what’s right in front of me. This is a way to warm up then enter my work-in-progress. Starting out is no time to be fussy, so I’m content with whatever words come, though hoping to stumble into sentences that make the ordinary old view seem new. Much of Views from a Window Seat: Thoughts on Writing and Life takes place at my pillowy perch by the window, my desk, or on the porch, where the cat sits a bit too close to my computer and a dog dozes near my feet. In this book, I write about how settings inspire me through their tactile surprises, but what’s seen or heard isn’t as important as the person who’s paying attention. 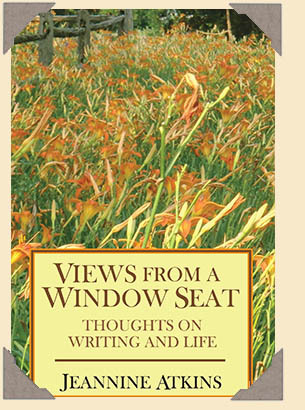 I try to take my window seat, or at least the way I see as a writer, everywhere I go. Views from a Window Seat includes some of what I’ve learned about what to include and leave out of a picture book manuscript, how to write historical fiction that doesn’t feel bogged down by information, and ways to bend chronology into plot. Other parts are about the problems and pleasures that come up no matter what forms we write in. These essays, short enough to read while finishing a latte or cup of tea, follow the seasons. In the spring section, I consider the challenges of beginning a book. In summer, I write about the slog that can be the middle of the book and suggest ways to feel re-inspired before going onward, and backward, through revisions. Just as we begin a book by scraping a way through a lot of not-knowing, we end with different anxieties and questions such as: Did I make myself understood? Can the language be tighter? Is this really done? How do I tell the difference between complacency and acceptance? Writing is forgiving. It means learning when to say, “Good enough,” and moving on, trying to make the next line or paragraph the best yet.